Today, cloud and SaaS ERP is becoming increasingly popular in emerging markets where most of the businesses are small and medium sized. Cloud ERP vendors are providing more innovative and sophisticated alternatives to on-premises ERP implementations. There are a number of advantages that cloud ERP Solutions deliver to businesses. This is particularly true for small and medium sized businesses which don’t have enough resources to implement conventional on-premises ERP solution. In general, a cloud ERP solutions cost lesser than on-premises solutions. The reason of this is because you are sharing some of the hardware costs (server, overhead and other costs) with other customers that are using the cloud ERP solution on the vendor’s system. Sharing the hardware costs with other users makes the cloud ERP solutions more affordable, and you do not need to worry about security issues. Another benefit is the lower IT costs. IT people who can handle ERP systems are expensive! When choosing cloud ERP solution, you also share the cost of IT staff with the rest of the vendor’s customers. This is especially important for small and medium size businesses, because in this way they avoid the cost of under-utilized staff in their organizations. On an average, a cloud ERP solution takes between one-half and one-fourth of the time taken to implement an on-premises solution. This is because the cloud ERP solution is already set up, with predefined modules, rules etc. and you just pay the subscription, plug in into it, with minimum modifications of the system you can start using it. Furthermore, since the basic ERP system is already set up at the vendor’s site, installation of your cloud ERP solution is a lot easier. A solid cloud ERP vendor will provide rich installation documentation, video tutorials and staff who are thoroughly familiar with the system to guide you through the installation. In order to decrease the implementation time and facilitate the whole implementation process, VIENNA Advantage Cloud ERP solution comes with: ready data import wizards, inbuilt video channels, inbuilt import formats, interfaces to other software, Excel imports, online trainings, and global support center. Furthermore, using VIENNA Advantage lets you have a complete control over your business and system data and structure. There is no limitation to the type of data you export or the formats. This is not the case for the most cloud ERP provides. Most cloud ERP vendors should allow you to purchase only the resources you need to run your ERP system. But they should also provide on-demand apps and resources to expand your system. VIENNA Advantage cloud ERP is multi-modular solution. 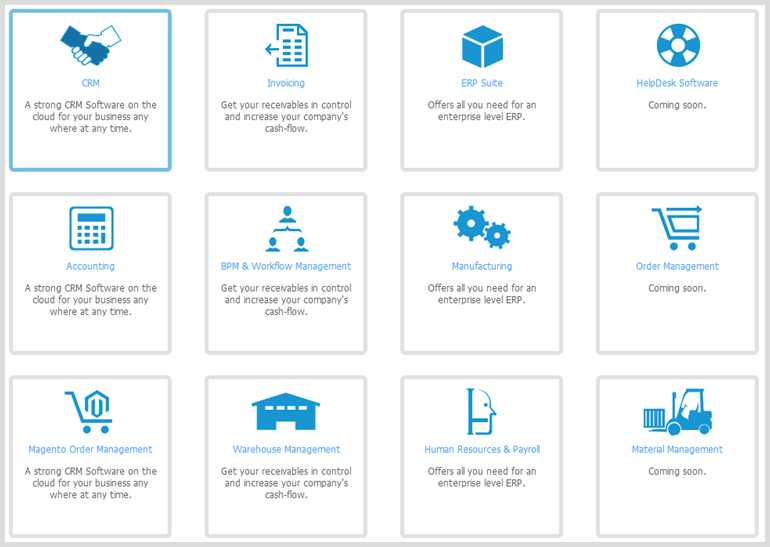 You can choose from the list of available modules and combine them in order to create the ERP that best suits your company needs. The installation and deployment of this modules is just a few clicks process. Moreover, you don’t need to worry about running out of resources such as storage or processing power and you’d only pay for what you need. Try VIENNA Advantage Cloud ERP solution for FREE! Register today and get 30 days unlimited support. If you decide to proceed with a cloud ERP solution, have in mind that you won’t need to worry about patches, add-ons and upgrades. All of them will be maintained by the cloud ERP vendor. In VIENNA Advantage Cloud ERP you can decide whether you want to upgrade the system or not. Moreover, you can decide to automatically install all new upgrades or choose to make the updates manually upon vendor’s notification. Cloud ERP solutions are web-based! This means that you can use your ERP from any place or any mobile device as long as you are connected to the internet. VIENNA Advantage Cloud ERP solution is based on the latest HTML5 User Interface and runs flawlessly on all mobile devices. The customizations in the ERP windows automatically reflect on all mobile devices. It has fast and user friendly interface, and it is featured on iPhone and Android devices. Try our cloud ERP today! Is cloud ERP the next step for your business?